Churchill Roberts, former co-director of the Documentary Institute, has been a faculty member in the College of Journalism and Communications since December 1997. In 2001-2002 he served as interim chair of the Department of Telecommunication, and in 2004-2006 served as interim associate dean for the College’s Division of Research and Graduate Studies. 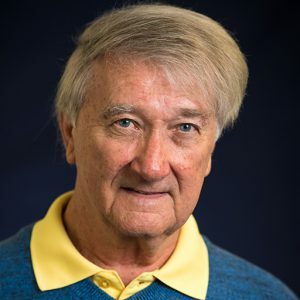 Mr. Roberts has published in numerous journalism and communication journals, including Journalism and Mass Communication Quarterly, Journal of Broadcasting and Electronic Media, Communication Monographs, Communication Education, Journalism Educator, and the International Communication Bulletin. He serves on the editorial advisory board of Journalism and Mass Communication Quarterly. He is co-author (with Samuel L. Becker) of Discovering Mass Communication. Mr. Roberts has served as co-director/co-producer of several PBS documentaries, Giving Up the Canal (1990), Campaign for Cuba (1992), Last Days of the Revolution (1994), Freedom Never Dies: The Legacy of Harry T. Moore (2001), and Negroes With Guns: Rob Williams and Black Power (2006). He and his colleagues recently completed Angel of Ahlem. Mr. Roberts and his colleagues have received grants from the Corporation for Public Broadcasting, Florida Endowment for the Humanities, USIA, USAID, the National Association of Broadcasters, Freedom Forum, National Endowment for the Humanities, National Endowment for the Arts, and the North Carolina Humanities Council. In 1994 he received the Distinguished Service Award from the Florida Community College Press Association. His teaching and research interests include documentary film, international telecommunication, and the impact of media on society. Co-director, Negroes With Guns: Rob Williams and Black Power, 60-minute documentary shot in high definition, with Sandra Dickson, Cynthia Hill, and Cara Pilson, 2004. Aired nationally on PBS’ Independent Lens, January 16, 2007. Winner of the 2006 Erik Barnouw Award for best historical documentary, presented by the Organization of American Historians. Co-director, Freedom Never Dies: The Legacy of Harry T. Moore, 86-minute television documentary, with Sandra Dickson, Cynthia Hill, and Cara Pilson, 2000. Aired nationally on PBS, January 12, 2001. Winner of the 2001 Erik Barnouw Award for best historical documentary, presented by the Organization of American Historians. with Samuel L. Becker, Discovering Mass Communication, 3rd edition (New York: Harper-Collins, 1992). Dr. Roberts’s focus is on documentary film production–particularly historical documentary. He co-directs the University of Florida’s Documentary Institute. The Institute has produced documentaries for national distribution on PBS, including Independent Lens. The Institute’s works include Negroes with Guns: Rob Williams and Black power, Freedom Never Dies: The Legacy of Harry T. Moore, Deciding Who Dies, Last Days of the Revolution, Campaign for Cuba and Giving Up the Canal.